Image caption Who was moody, who was the class geek and who squeezes their spots? 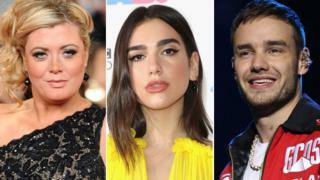 As BBC Radio 1 celebrated some of the country's most exceptional young people at Sunday's Teen Awards, we asked the stars on the red carpet what their own teenage years had been like. Their stories weren't quite as inspirational as this year's winners - who have influenced government policy on foster care and set up a charity for young people looking after parents with mental illness, among other achievements. But the stars' stories certainly illustrate that the turmoil and trauma of teen-hood is common to us all. I wasn't grumpy, I was quite chilled. Just trying to get school over with as quickly as possible. Did you ever call a teacher "mum"? How did you celebrate your last ever day of school? Me and all of my mates, scribbling on our T-shirts, then going out and getting drunk. Acne: Squeeze it or leave it? I squeeze it. You have to. What are your teenage horror stories? Amber: Probably getting told off in school for wearing too much make-up. Kem: I never had a girlfriend. That was my horror story. What was the soundtrack to your teenage years? Kem: High School Musical! I can't help it, I know all the lyrics. The limited edition ones and everything. Amber: It's true. He sings them all in the shower at home. Did you ever try see an 18-rated film at the cinema? Kem: Yeah! It was American Pie. I used my brother's ID and sneaked in. It said I was 25 and I was 14. They were looking at me weird because I was wearing, like, a full-blown suit to the cinema. What was your first-ever date like? Amber: Someone picked me up in the car and took me to McDonald's. What's the most romantic menu item at McDonald's? Probably a Crunchie McFlurry. Um, I might have been a grumpy teenager. I never really snuck into many movies. But my first favourite movie was Jurassic Park. Squeeze it at the opportune moment. You have to wait for the right time so you don't leave a mark on your face. I was awful! I was just moody and I used to hit my sister a lot. Like, hard. She used to have red marks and stuff. It was bad... but I'm not that person any more. I was a pretty awful teenager. I always did that! It's so embarrassing. Oh my God. We got drunk in someone's garden. We had a little party. Spent £5 on wine and drank it through a straw. Classy. I was always very studious at school, if I'm being honest. I never messed about. For any teenagers out there, you just need to follow yourself. Don't look at magazines, don't think it's OK to go and have plastic surgery. Just be yourself and embrace who you are. How did you celebrate your last ever day at school? I think I rocked up, jumped on the school desk, did a bit of Madonna, singing and dancing. I always told everyone at school I was going to be famous. And look! Leave it! Go to your doctor. I used to have really, really bad skin but I got this amazing roll-on from my doctor, and now I have lovely skin. I was easy-going. I had a big old group of friends, and we were out all the time being sociable. I loved being a teenager. Yes! Especially as both my parents were teachers. You just want the earth to swallow you up. What was your worst holiday job? I worked in a sweet factory. People picture me as an Oompa-Loompa but actually you had to wear a lab coat and a hat and put Jelly Babies into boxes all day. Did I eat some? Well, I seem to remember them fitting a CCTV camera while I was working there. And my skin got the worst it's ever been. I was pretty naughty - but my mum always said I was just curious. I wanted to find out how much I could push the boundaries. I got unofficially expelled on the very last day. I went to boarding school and we had classes on Saturday. But I'd finished all my exams and me and my friends were like, "Why are we here?" So we skipped school and went into town and had a few drinks. We were definitely underage. The school was like, "If you were staying, you definitely would have been expelled." Do you know what? I've never really been taken on a first date because I've always been friends with people before dating them. So the actual first date I ever went on was three years ago, when I was 20. It was ice skating and I was terrible at it. It's not romantic when they're really good and you just look like a muppet. So ice skating's not for me.